But what I didn’t know is that—years later—that course would actually help me become a better reading and phonics teacher! Let’s back up a little. My undergraduate majors in college were Elementary Education and Spanish. The Spanish major required that I take all kinds of history and literature and language courses—hence the linguistics class that I dreaded so much. Somehow, I passed the class. 🙂 And I graduated and started teaching Pre-K and then Kindergarten (in English). I knew embarrassingly little about teaching phonics in English (sorry, kids! ), but I stumbled and fumbled my way through. Somehow those Kinders learned how to read! When I had a deeper understanding of the structure of the language, I was a better phonics and reading teacher. When I didn’t have a deep understanding of the structure of the language (even though I’ve spoken English all my life), I wasn’t well equipped to provide strong, clear phonics instructions. Although my undergraduate reading education program was good (and so was my graduate degree in reading/literacy leadership), in hindsight, I wish that I’d learned more about the structure of the English language and how to teach phonics to my students. I’ve had to figure out a lot on my own. I’ve also taken 30 hours of Orton-Gillingham training. I wanted to do all this to become a better teacher, but wouldn’t it make more sense if this information was shared with EVERY elementary or early childhood teacher during their degree program? If you’re in the same boat that I was and would like to learn more about the structure of English and teaching phonics, then you’re in the right place! This is the first post in my new phonics series. 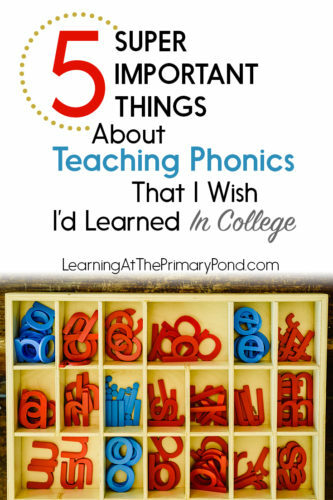 In today’s post, I’m going to share 5 essential things about teaching phonics that I wish I’d learned in college! 1. One in five students NEED explicit, systematic phonics instruction (that uses multisensory techniques) in order to become proficient in reading. Systematic, explicit phonics instruction is important for all students. But at least 20% of our students show signs of dyslexia. Many of those students will not become fully proficient readers unless they have clear, systematic, and explicit phonics instruction. This means that we need to teach sound and spelling patterns in an order that’s developmentally appropriate, incorporate frequent review, and show students how to apply that knowledge to reading and writing. Students with dyslexia also benefit from multisensory phonics instruction (instruction that incorporates multiple senses; for example, tracing a word in the air while simultaneously spelling it aloud). 2. Students are better equipped to decode words when they know syllable division rules. For a long time, I didn’t know the syllable division rules for English. Nor did I understand that knowing the rules can help readers figure out vowel sounds and decode words! I’ll address the syllable division rules in a future post. 3. There are 6 different types of syllables in the English language. That’s it—only 6! Students benefit from learning the 6 syllable types and knowing how to use them to decode words. In a future post, I’ll explain more about the syllable types. 4. Multisensory phonics instructional techniques (that are sometimes deemed “for special education”) are fun and useful for ALL students. In #1, I mentioned that 20% of kids show signs of dyslexia and need multisensory phonics instruction. You may not know (at least not at the beginning of the year) which students fall into this 20%. However, ALL students benefit from learning phonics in a systematic, explicit way, through multisensory techniques. So you can use this “stuff” with everyone! 5. We can predict (some) reading difficulties at a rather early age. This one’s for you, Kindergarten teacher friends! (And probably first grade teachers too.) If you notice that some of your students are really struggling with phonological awareness skills, this is an indicator that they may struggle with reading in the future. Researchers now believe that people with dyslexia have weaker phonological processing abilities than their non-dyslexic peers. Tasks like rhyming or segmenting words can be more difficult for students with dyslexia. But here’s the good news: when you know this, you can start providing extra support and interventions right away (like more phonological awareness instruction and practice). This post is just the tip of the iceberg. I have lots more planned for you! I hope that this series will help you feel more confident in teaching reading and phonics. And I’d love to hear from you in the comments if this is an area in teaching that you feel/felt under-prepared for! See you next Saturday for the next post!